Best yet, Will continued to celebrate after his lift. Check out a follow up video below (also by Alex Wood) that shows him still filled with adrenaline (and Tiger's Blood?). UPDATE: Apparently I've got the timing of the two videos entirely wrong. The twitter video showing Will in the tiger's mask was actually his entrance into the clubhouse. He would then prepare himself for the deadlift right afterwards. In honor of the Will I made a bunch of fantasy Baseball cards of him. On the top left I used a pic taken by Jon SooHoo/LA Dodgers 2016 and the 1988 Donruss Baseball card design. The top right card uses another pic taken by Jon SooHoo/LA Dodgers 2017 and the 1993 Upper Deck Baseball card design. As you can see, it is of Will's grove that has been expertly drawn on by Kenta Maeda. 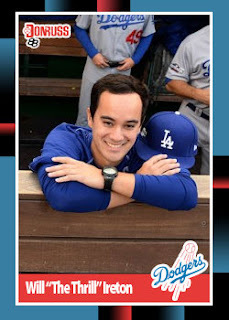 For his next card I took a screengrab originally found at Dodgers Digest and used the 1982 Topps Baseball card design. On its right is another screengrab from an instagram video and the 1981 Fleer Baseball card design.